This structure is something of a mystery to me. 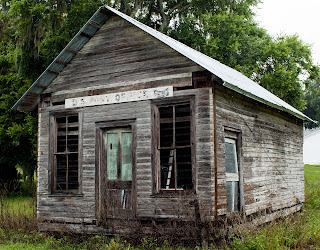 It sits abandoned in McIntosh, Florida but there is an old faded sign on the left side that says "Cross Creek". Cross Creek, made famous by Marjorie Kinnan Rawlings, is a few miles away. I'm hoping that someone sees this and has some insight into the history of this building. If so, please let me know. Cool photo! I think you mean Marjorie Kinnan Rawlings, rather than Harriet Beecher Stowe. Stowe did spend time in Florida (Mandarin), but it was Rawlings who lived at Cross Creek.